Compare registrar pricing on domain names. When you own hundreds, thousands or more domain names, registration and renewal prices matter. While .com prices don’t vary much from registrar to registrar, prices on new TLDs and country code domains can be priced orders of magnitude higher from one registrar to the next. Now you can easily see how much registrars charge with Registra.rs, a service from domain sales price engine DNPric.es. Not only can you see the first year registration price, but you can also quickly compare renewal and transfer prices. This is important because some registrars have discounted first-year prices but much more expensive renewal prices. 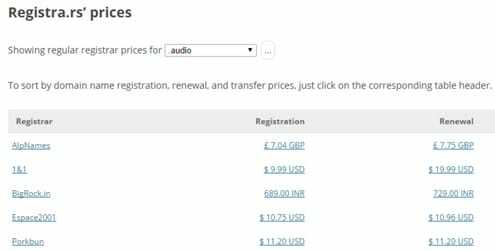 For example, if you’re looking for a .audio domain, you’ll see that AlpNames and 1&1 have the lowest first-year price. But 1&1 will double the price in year two, so if you plan to hold onto the domain, you might want to register it somewhere else. Of course, if you have special pricing with your registrar, this won’t be reflected in the price charts. This is a useful and free tool worth checking out. Word to the wise, I would never use AlpNames.com as a registrar. There are numerous horror stories about them and their lack of support. Not keen on alp, renewed some domains with them, decided to let one expire only to get an email down the track informing me that one of my domains had been successfully transferred to a third party. Major stress thinking I had been hacked. Just the domain I let lapse being grabbed by them. Out of curiosity (as I have been thinking of transferring some of my portfolio to them for some time…), I have tried to find these “numerous horror stories” about AlpNames and, apart from a few militant forum posts back in the day – when they were clearly having teething problems – I cannot actually find that much…are you able to provide a legitimate reason for warning people off them??? Using them to register new TLDs as they have quite good prices there. No complains. You can even ask them to give you a reseller account with better prices. Epik has a dual-pricing model. We provide domains at cost for domain investors, e.g. $8.10 for .COM and probably the lowest pricing on premium gTLDs of anyone. Retail customers pay retail because they expect and often need full-service. Domain professionals, by contrast, are supply chain partners and get domains at cost. The retail customers pay the overhead. Win-win. Yes, contact us at support@epik.com or email me directly at rob@epik.com and you can fund your account with Bitcoin at the prevailing exchange rate. The registra.rs system is interesting – from experience it is hard to get consumers to trust a price comparison site that includes its own pricing, especially where promo pricing and the lowest pricing is the affiliated site – the optics are often something that a consumer immediately distrusts initially without a lot of disclosure. Registra.rs lists DNPric.es at the top only on one tld, namely .LY, where it beats the rest. Registration, renewal and transfer prices are passed directly from all registrars without any changes or filtering. Typically I use registrars I know and trust rather than chasing down the best prices. I never use 1and1.